Your home is much more than just a place where you eat and sleep. Whether you work from home full time or simply need a command center to manage your family’s schedule, many of us now need a dedicated home office. If you have a small space, you may feel like you don’t have room for an office, but with this plan, you can find creative ways to fit an office into even the smallest of spaces. Start by looking at your space to see where there are unused nooks and crannies. One way to find space for an officeis by switching up a room’s layout, like the living room or bedroom, to create room for a small desk. Another idea is to use an overlooked space, like a closet or a nook under the stairs. In either case, it could help to add a built-in desk. The benefit of built-in desksis that they give you the work area you need without taking up a lot of space. Don’t assume that creating a home office has to be pricey. If you have room in your budget for a top-of-the-line ergonomic chair, you can’t go wrong splurging on comfort, but this project really doesn’t have to break the bank. We love finding inexpensive ways to combine style and function, like this ideafrom The Simple Dollar for making a decorative whiteboard. Along the same lines, you can change the tone of a room dramatically by painting or wallpapering a single wall. 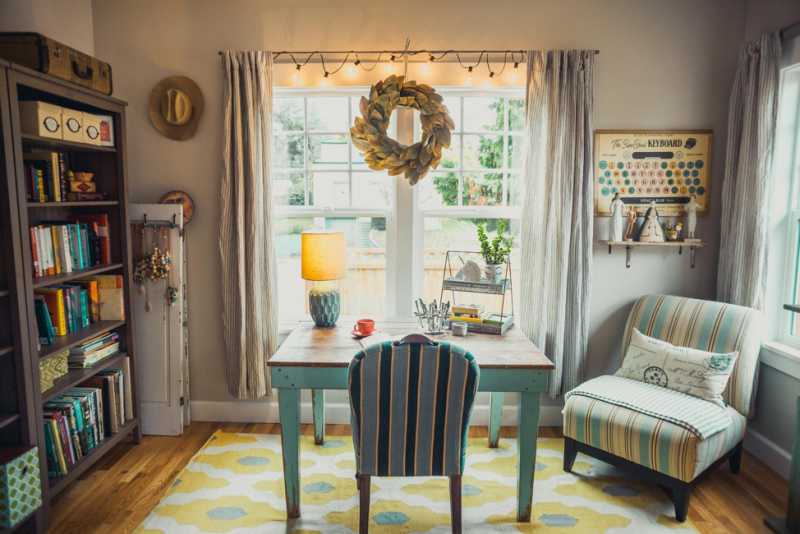 Gather some ideas for inexpensive decor, and keep this cost savings in mind when determining what you can afford when it comes to bigger expenses like furniture. This is the fun part - designing your office or work area! The great thing about having a home office is that you can break free from drab grey and black. If you’re a minimalist, you can stick with white walls and sleek design, or if you’re more eclectic, don’t be afraid to go bold with color. Either way, this space is your own, and it should reflect your style while maximizing productivity. Furniture: Besides a small desk, you should find a low-profile desk chair. Bigger, traditional desk chairs could easily overpower a small space. If your home office is a nook in the living room or kitchen, you may even opt for a dining chair. Storage: Staying organized is especially important in small spaces, because clutter can overwhelm you quickly if everything doesn’t have a place. If you add a built-in desk, this is the perfect opportunity to build a section of shelves right in. We also love theseDIY storage options from Decoist that make use of wall space. Don’t forget about tech storage too. Even in a small space, cords and devices need their own spot where they’re out of sight when not in use. Decorate for Inspiration: Besides using colors you love, find other ways to add decor that inspires you. This doesn’t mean decorating with inspirational quotes (although you certainly can). Inspiration can be anything that makes you feel good, whether that’s natural elements like woodor framed artwork that speaks to you. Add Warmth: Make your workspace feel homey with decor touches that add warmth. Don’t overlook the floors when decorating. Finding the right rugcan pull the space together, and having something soft underfoot feels comfier than hard flooring. Add warmth by being selective about lightingas well. If you can, set up your space to make the most of natural light, and supplement that with a good task lamp. Don’t hesitate to give this space your own style! The goal with setting up your home office is to create a space that’s conducive to productivity but still feels homey. All it takes is some smart planning to achieve creating a small home office that works for you.